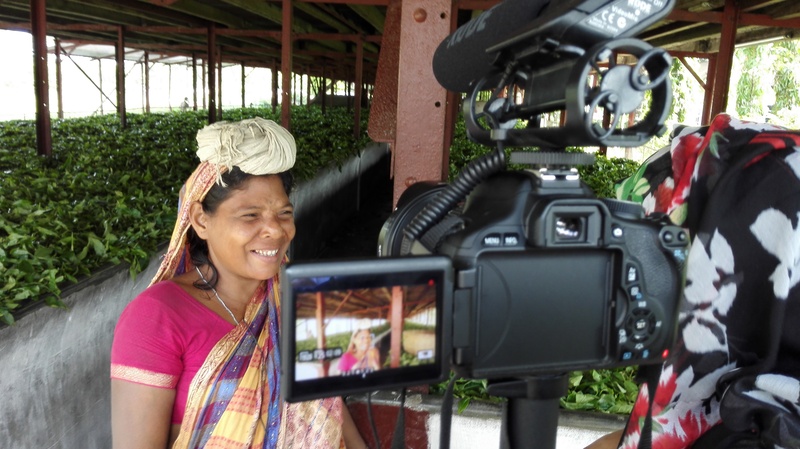 Tea Estate Workers – Marginalised Communities: Shahjalal University of Science & Technology (SUST) Collaborative Project. Future Voices International in partnership with Shahjalal University of Science & Technology (SUST). Lead Professor Dr Tulshi Kumar Das of development studies selected five MA level graduates from SUST to assist within this project and gain a invaluable insight into professional practices of pilot research. Social segregation of tea estate communities is a common practise faced here in the Sylhet region. This deprives the tea estate workers opportunities and traps them into a cycle of life they were often born into with little prospect to enter other fields of work or living settlements. This affects not only the workers but also the families and children of the workers. These children are deprived an education in local mainstream schools due to their ‘belonging’ to the tea estates. This is coupled with the low level of awareness in the importance of education among the community as they feel it can’t help them escape this form of life. This Unspoken World project attempts to look at methods we can break cultural norms in an attempt to improve social integration and ease the stigma faced by communities wishing to coincide together with the greater Sylhet community. The project was an initial look into the issues faced by these communities and in the near future we wish to create a series of collaborative workshops between tea estate and wider Sylhet communities in an attempt to break down divides and improve social cohesion. Coming soon you will be able to see a sample of what is to come and the stories that need sharing with a wider and global audience. This is a tiny part of a social documentary we wish to make on the subject and use it as a educational tool within the region. 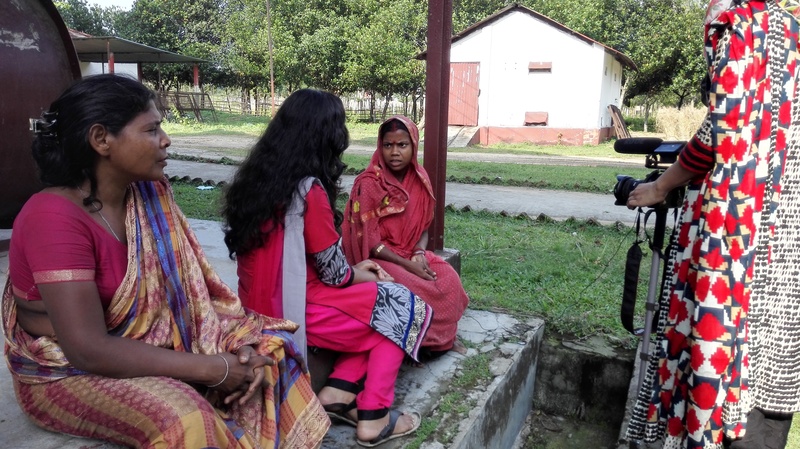 This is our story: Laxmi, Biraj & Manju. This short film was created in Kathmandu, Nepal. As part of the Future Voices International Media Litracy programme. This film was made by the young participants of ECDC, they used the medium of film to share their concepts, ideas and thoughts through with both the local and now the international community. ECDC is dedicated to helping the children of imprisoned parents in Nepal, many of whom were living inside the jails alongside their mothers. This is no place for children and we are commited to giving them the shelter and education needed to break the cycle of crime and poverty. ECDC’s Butterfly home provides these children a safe and nurturing environment where they can spread their wings to discover a brighter future. 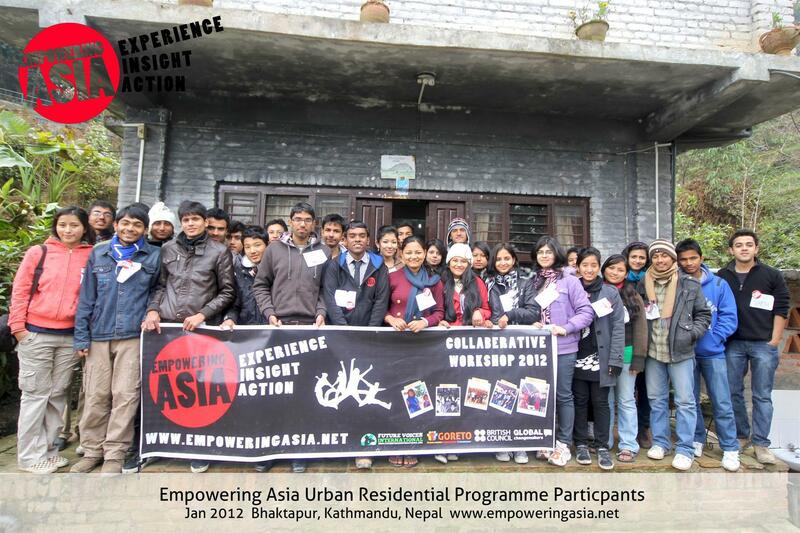 Created as part of the Future Voices International Programme Nepal. Production & Direction: Sadiq Miah. So as many followers know one of our supporters the Global Changemakers was announced it would end last year. Over the course of the last 6 months the core team have managed with hard work and dedicate to bring it back again. There are going to be a number of changes and it will take time for it to develop but it is incredibly good news for like minded young people who wish to enter international development. 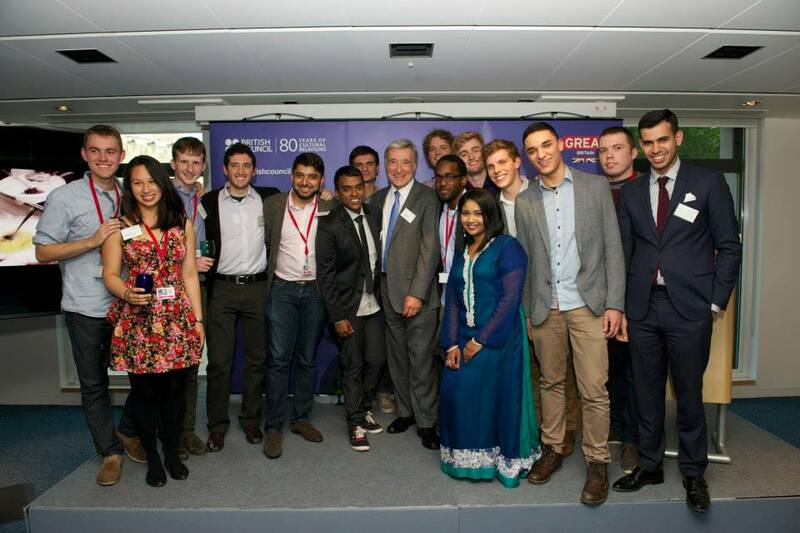 It was a pleasure joining the team of global changemakers at the official comeback reception in London. There were many familiar faces and many new ones too. I am very excited for the team behind all this and we as a organisation are forever in its debt for helping us start-up and guide us. So big welcome back and thank you. 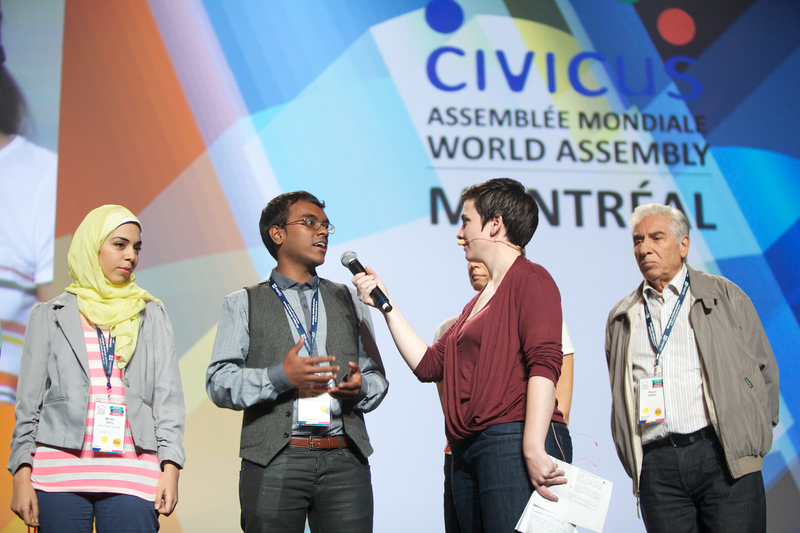 CIVICUS World Assembly 2012 – Montreal, Quebec, Canada. The role of business in global governance; that was the topic we were addressing at the Annual World Assembly. Future Voices Intl was invited to speak on a global stage and share its unique approach to helping create economically self-sufficient communities with its vocational training programme. We use and promote the use of creative expressive arts to give marginalised communities a voice and platform to share their social issues with both the local community and the world. The process to get to a stage where communities are equipped with the skills to share their stories they have learnt marketable job skills enabling them to enter employment or higher education. In the time we have been operating our programmes we have had success stories with past participants of the programme moving on into industries related to the skills we cascaded to them. We at Future Voices Intl work with communities and business to look for areas where there is a need for certain skills and we do our best to provide training to our participants in these areas, giving them the best chances possible. This close relationship between us and the local business allows us to promote the idea of apprenticeships allowing our students to gain real world experience and business to highlight potential employees. We were able to share our methodologies and learn best practises from other organisations and plan steps to create better policy to work towards in the future. The experience was very insightful and we feel there is a lot to take forward from the World Assembly. Our director Sadiq Miah was additionally invited to speak at the closing ceremony addressing the attendees and live streams across the world which was a fortunate privilege. For additional images and information please visit the official CIVICUS page. 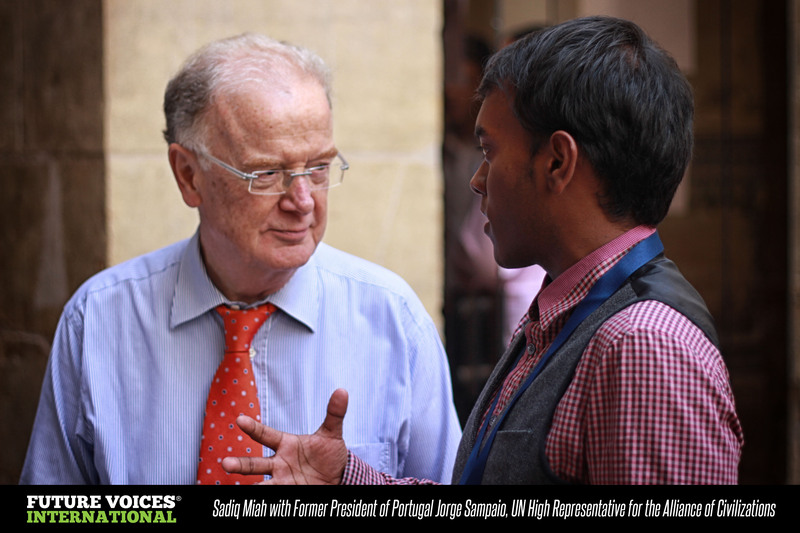 Our founding director Sadiq Miah recently attended the 3rd Annual United Nations Alliances of Civilisations summer event under invitation of President of the Portuguese Republic (1996-2006) Jorge Sampaio current acting High Representative for the United Nations Alliance of Civilizations. The event organized by the United Nations Alliance of Civilizations is in cooperation with other partners, such as the League of Arab States, the North-South Center of the Council of Europe, the Euro-Mediterranean University (EMUNI), the Gulbenkian Foundation, the Aga Khan Development Network as well as the Government of Brazil. The 2012 event was hosted by the University of Coimbra and took place from 5 August to 13 August 2012. The last two days were spent in Braga (Portugal) at the invitation of “Braga 2012, European Youth Capital” to celebrate International Youth Day. 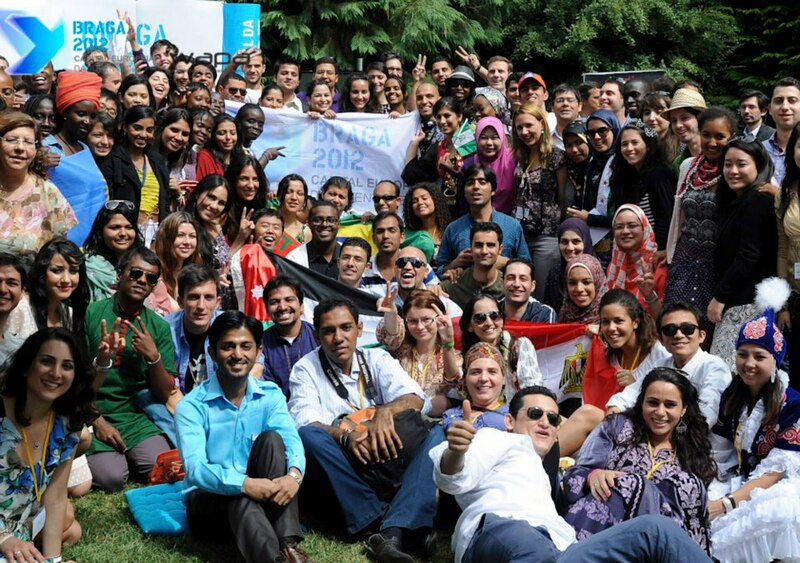 Under the theme “Bridging Hearts, Opening Minds and Doing Things Together”, the aim of this UNAOC programme was to bring together young organisations to enhance their knowledge and reinforce their ability to communicate across difference, interact with the “other”, and look at diversity as an asset for cross-fertilization. This project was a week-long program using a variety of educational approaches such as methodological and political inputs, small group discussions, peer-led workshops, visits to religious sites, etc. Themes such as multiple identities, globalization, the role of media in breaking or reinforcing stereotypes, human rights and diplomacy, etc. were explored thanks to the contribution of several regional and international experts who came to Aveiro to share their thoughts and have dynamic discussions with the participants. The Secretary-General of the United Nations, Ban Ki-moon made a point of sending a message to more than 145 youth who participated yesterday in Braga, the official ceremony to celebrate the International Youth Day. Ban Ki-moon congratulated Braga 2012: CEJ to celebrate the International Youth Day in conjunction with the participants of the Summer School of the Alliance of Civilizations, a UN initiative that brings together young people from around the world to learn and empower themselves to each other through of inter-cultural dialogue. Future Voices International was able to gain fundamental new partners to assist with the implementation of new project ‘Unspoken World’ an innovative new approaches to using communication media to empower invisible communities facing social issues caused by the minerals exploitation industry. For further details please visit www.unspokenworld.org & www.unaoc.org. Empowering Asia is a campaign to promote the spirit of scholarship, leadership and citizenship amid high schoolers in the South Asia region and give them the tools, skills and necessary inspiration to be a part of the digital revolution and ultimately active agents of impactful change in their local communities. The campaign will provide inspirational empowerment sessions and capacity building trainings in ways that hone the student’s intellectual and leadership abilities, equip them with ‘change-making and communication media’ tools including helping them add their own voice in local issues, and as a final outcome, assist them devise their own sustainable community oriented action programs to put into practise their new ideas in their local communities. This campaign will directly engage and involve at least 2000 high school students in Bangladesh, India and Nepal. Founding Director Sadiq Miah was invited to attend and speak at Google Zeitgeist, one of the most high-powered gatherings of business leaders, thinkers and those that are considered to generally shape the global future. Sadiq Miah | Future Voices International: Speaking at Google Zeitgeist 2011, Panel with Martha Lane Fox & Jon Snow. We are very proud to have be part of this year’s Zeitgeist event as it is an exceptional opportunity to showcase the work of our organisation to the biggest names and companies in the online and technology world. Attendees this year will include Angela Ahrendts chief executive of Burberry, Maurice Levy chief executive and chairman of Publicis, Claudio Corbetta Managing Director of Dada.pro, the Chancellor George Osborne, Yuri Milner the founder of Russian tech-giant and Facebook investor DST, and Professor Stephen Hawking the director of research at the Centre of Theoretical Cosmology at Cambridge. Joseph Stiglitz the American economist, Martha Lane Fox the founder of lastminute.com and the Government’s “digital champion”, and Simon Wolfson the chief executive of Next, were also be at the Grove Hotel in Hertfordshire, where the event was being held amid tight security. The Zeitgeist event has a series of talks taking place over the two days, and I was given the opportunity to be part of a panel, sharing my experiences with Future Voices International. The experience was exceptional and the response from the attendees about our project was very positive. Public speaking on such a scale in front of a packed audience with a net worth in excess of multiple billions of pounds is a rather daunting experience! The Google host’s were fantastic; they prepped us well, with specialist master classes taking place exclusively for the Youngminds. We had personalised inspirational sessions from people like, Jared Cohen, Geoffrey Canada and a variety of lead Google’rs. The prospect for Future Voices International are endless, this opportunity hopefully will give us the exposure and to continue changing lives of people living in hardship and bringing their social issues to the forefront.